How Lutherans Sort Out the Christian Life | The Old Adam Lives! Paul: “And no wonder, for even Satan disguises himself as an angel of light” (2 Cor 11:14). Luther: “One thing is sure: We cannot pin our hope on anything that we are, think, say, or do” (Smalcald Articles III/III:39; Tappert, p. 309). Forde: “[T]he Christian life will be hidden from this world and inexplicable to it. Sometimes –perhaps most of the time—the Christian life will appear to follow quite ordinary, unspectacular courses no doubt too ordinary for the world. But sometimes it will appear to go quite contrary to what the world would deem wise, prudent, or even ethical. Why should costly ointment be wasted on Jesus? Would it not be better to sell it and give to the poor? . . . Why should a Christian participate in an assassination plot? . . . The Christian life is tuned to the eschatological vision, not to the virtues and heroics of this world…The attempt to break the hiddenness is precisely the dangerous thing” (“The Christian Life,” Christian Dogmatics, 2:441). Bonhoeffer: “I thought I could acquire faith by trying to live a holy life, or something like it. . . . I discovered later, and I’m still discovering right up to this moment, that it is only by living completely in this world that one learns to have faith. One must completely abandon any attempt to make something of oneself, whether it be a saint, or a converted sinner, or a churchman (a so-called priestly type! ), a righteous man or an unrighteous one, a sick man or a healthy one. By this-worldliness I mean living unreservedly in life’s duties, problems, successes, and failures” (Letters and Papers, 7/21/44). Oberman: “The ‘joyful exchange’ of which Luther speaks does not lead to the sweet experience described by Staupitz, for in the battle with the Devil there is no rest, no peace, and no visible success” (Luther: Man Between God and the Devil, p.184). Harrisville: “The hallmark of apocalyptic, ancient or modern, is visibility, the persuasion that God will be visibly manifest at the end of days for judgment or salvation. From this apocalyptic persuasion Paul came to his encounter with Jesus Christ. What occurred to that persuasion in the encounter can only be described as a fracture, reflected in his heralding of the appearance of the ‘day of God’ in the event of Jesus Christ as received by faith. . . . No visible, demonstrable change in human existence or human history occurred with it. . . . The cross, by which God appeared under the sign of visibility’s opposite, established the ‘new creation’ as hidden. This hiddenness and its resulting ambiguity distinguish Paul’s eschatology from that apocalyptic persuasion to which he had originally held (“The Eschatological Significance of Justification for Preaching,” By Faith Alone, p. 301). Juel: “We do not believe there is a single heavenly code which religious people know better than others. ‘Natural law,’ through which God ordains order, is embodied in human codes – some better, some worse . . . . In our deliberations, the wisdom of Scripture and the tradition cannot be cited as “God’s answer” to the matter, but neither ought that wisdom be summarily dismissed as irrelevant or outdated” (“Homosexuality and Church Tradition,” Word & World, X:2  p. 167). Grane: “Justification by faith does not make human efforts futile or unimportant, just as it would be a misunderstanding to think that a Christian point of view should involve separating ourselves from all people who want to do something in the world. On the contrary, justification by faith means the freedom to endure justification’s confusion with [ethical] idealism because one’s life does not depend on works, and because there are no Christian works. . . . Faith remains hidden to the human eye. . . . The relationship between justification by faith and ethics does not imply a new ethic, but it makes us free to distinguish between good and evil and to act accordingly without any wish to obtain anything” (“Justification by Faith? An Unguarded Essay,” By Faith Alone, p. 39). Käsemann: “Neither the scriptures nor the world can be adequately grasped except through belief in the justification of the ungodly. . . . Justification and salvation history belong together. But everything depends on the right co-ordination of the two. Just as the church must not take precedence over Christ, but must be Christ-determined without itself determining Christ, so salvation history must not take precedence over justification. It is its sphere. But justification remains the centre, the beginning and the end of salvation history. Otherwise the cross of Jesus would also inevitably lose its central position and then everything would be distorted – anthropology and ecclesiology as well as Christology and soteriology” (Perspectives on Paul, pp. 75-76). Lønning: “Everything in the universe of Luther’s Reformation stands or falls with the thesis of the clarity of Holy Scripture. . . .The function of the thesis of the clarity of Scripture, however, is only properly recognized when the essential content has been somewhat correctly determined. For Luther it is not a question, as is later the case with Orthodox dogmatists, of the quality of transparency (perspicuitas), which statements of Scripture should in a specific way have. Rather, the expression claritas scripturae should be understood quite unambiguously from the contrast between light and darkness and the imagery associated with these two concepts. . . . It is decisive, however, that all the key teachings of Scripture (res scripturae) lie in bright daylight. 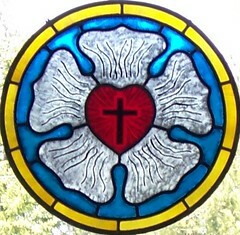 This has been so since Christ’s resurrection: the incarnation, the doctrine of the Trinity, the atonement, the Lordship of Christ, all these have become accessible through the fact that Holy Scripture henceforth is presented as the pure proclamation of Christ and only as this” (“ ‘No Other Gospel’: Luther’s Concept of the ‘Middle of Scripture’ in Its Significance for Ecumenical Communion and Christian Confession Today,” Luther’s Ecumenical Significance, pp. 233-34). Lindberg: “The idea of an order of God, the goal of which is personal renewal, displaced justification as the mid-point of Pietist theology . . . Luther, on the other hand, remains with an ongoing battle between the old and new person which is never transformed into a visible victory on earth. . . To Luther the gospel is radical good news because it is the proclamation of salvation not a program for salvation” (“Justice and Injustice in Luther’s Judgment of ‘Holiness Movements,’” Luther’s Ecumenical Significance, p. 172). Thanks to flickr and fyrrylikka, for the photo.